Cordyceps sinensis also known as caterpillar fungus is commonly mistaken as a mushroom but is actually a parasitic fungus, indigenous to China and Tibet. Cordyceps sinensis is formed when the fungus attacks moth caterpillars infecting it with spores during fall then germinates over the winter. When spring comes, the fungus has completely killed and mummified the caterpillar growing and producing a long slender fruiting body. The fruiting body which is composed the remains of the caterpillar and the fungus are then hand collected, dried and preserved to be used as an herbal medicine. 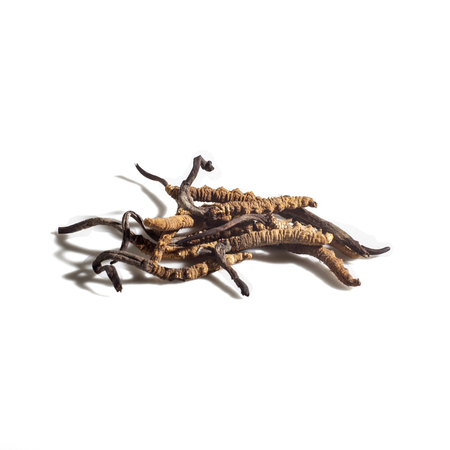 Cordyceps sinensis has been used for centuries in traditional Asian medicine and Chinese medicine, although only as of late that the western medicine has taken notice for its medicinal benefits.